Mexico surpasses Japan and Germany in trade surplus with the U.S. 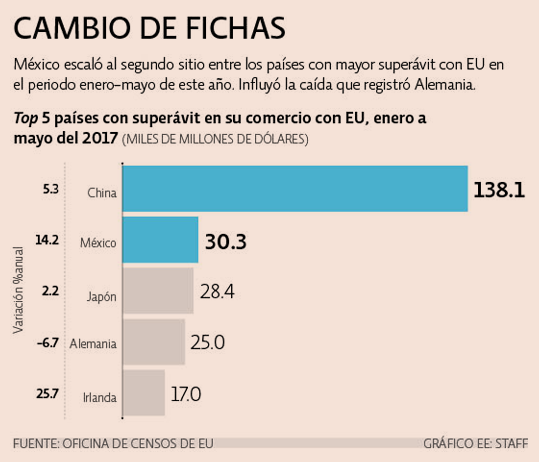 According to the US Census Bureau, during the first half of 2017, Mexico superseded Japan and Germany in terms of largest product trade surplus with the United States. From January to May, Mexico’s positive balance with the United States was of $30 billion dollars, while Japan’s was of $28 billion, and Germany’s $25 billion dollars. The sum of these three surpluses is equivalent to more than 60% of China’s, which is $138 billion dollars. Such data is what maintains the Asian country in the lead. Surprisingly, Mexico’s positive balance represented a 14.2% increase compared to January-May 2016, when the surplus was $26 billion dollars. On the contrary, Germany decreased its surplus with the United States by 6.7% during the same time period . Throughout 2016, the United States recorded its largest trade deficit with China for $347 billion USD, followed by Japan ($69 billion), Germany ($65 billion) and Mexico ($63 billion). As stated by the US Census Bureau, the United States has a 12% trade deficit with Mexico as a percentage of its total trade volume. Such information was recently considered as “moderate” by the Ministry of Economy, since it ranks 11th among the largest negative balances in the United States, taking into account the same relationship among the countries. During 2016, the United States recorded its main trade deficit as a percentage of its total trade volume, with Ireland (65.3%), followed by China (60%), Italy (45.9%), Germany (35.9 per cent) and Japan (35.3%). In May 2017, the US trade deficit with China was $32 billion dollars, while Japan’s was $5,7 billion USD and Germany $4,9 billion USD. The United States reduced its May trade balance deficit to a monthly rate of 2.3%, to $46,5 billion. Such result was caused due to a growth in exporting of 0.4% (192,000 billion dollars); and a decrease in importing of 0.1% (238,500 billion USD). The trade deficit with Mexico during May amounted to $7,2 billion USD, being the highest deficit [for a month] since October 2007. The Mexican country was the one with the topmost proportion of its Gross Domestic Product (GDP) regarding the importation of US products.